There was a time when trailer boats were either dinghies or runabouts – or memory suggests there was. Consoles, centre cabs, cuddies and others are now more fashionable, but runabouts are still holding their own. 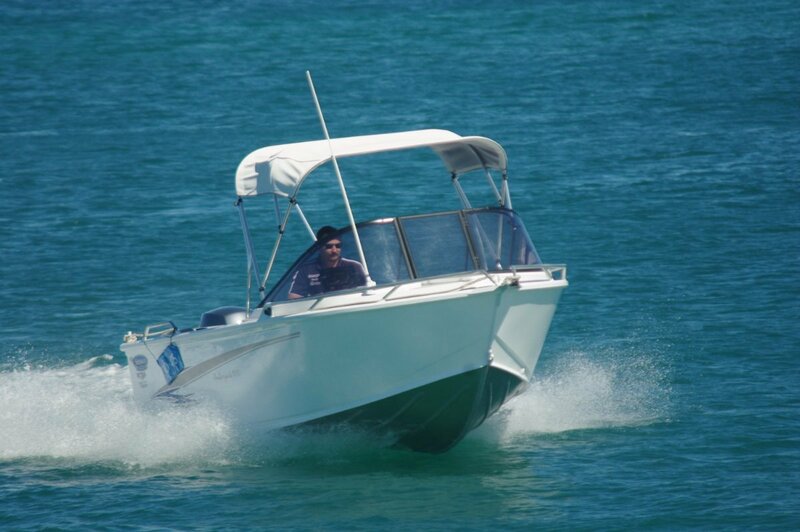 The five-plus metre review Stessco Amberjack 510 is a fine example of the developed runabout. Its runabout layout puts the two main seats – very good pedestal swivels - well forward, maximising the cockpit area. The seats are at a windscreen equipped with a perimeter grab rail; or rather all of the perimeter except for the centre of the windscreen that opens to give passage to the anchoring position. A hatch lid normally covers this position. The foredeck and the two consoles below and behind it are formed from a one-piece fibreglass moulding that also provides stowage ahead of the two seats. This is a neat job of work, better than most GRP-aluminium combinations I have seen. Stessco claims the Amberjack has a “softride” hull, and is confident enough to paint the claim on the hull itself. An unscientific scan of the bottom suggested a slightly steeper deadrise than previously, and broader chines to balance it. Unfortunately a day virtually without any sea gave us no chance to test the rougher water ride quality. What was noticeable was with both forward seats occupied and no one aft we were still well cushioned. We were sitting right in the slam zone without any slamming. In tight turns there was no tendency for the boat to pivot on the bow. A result of reasonable size in the boat and of good design. The manoeuvring and handling generally were well tested; despite the lack of sea we had all the offshore breeze we could ask for. Parking at the jetty called for brisk movements of the wheel and throttle-gear lever, which was well assisted by the good run of the cables and the non-feedback steering. 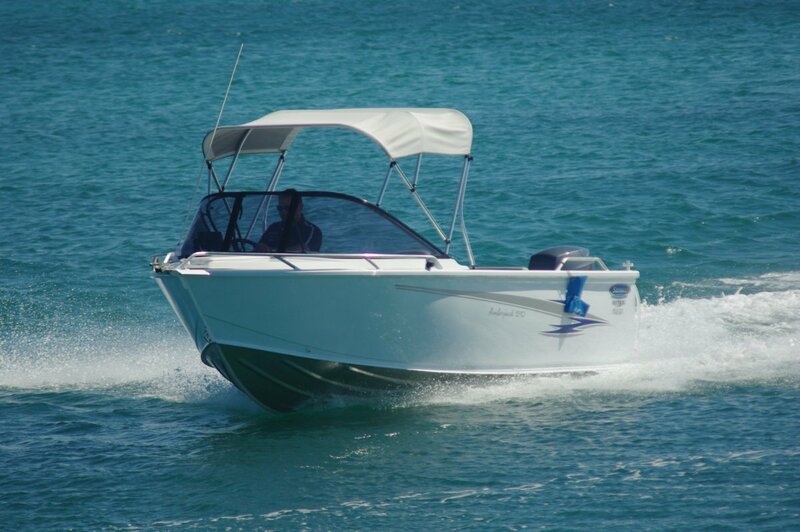 It was a positive and pleasant boat to drive; better than average in the driving position it provides both sitting and standing. The range of appropriate power is probably between 70 and 115hp. We had a 100hp Yamaha on the back. Had we opted for the 70 we would have saved nearly $3,000 off the overall price of $42,500 and would likely have regretted it: the 100 gave effortless performance without feeling at all over powered. The Amberjack has an unusual lounge arrangement aft. The basis of it is an upholstered box mounted transversely near the starboard quarter, with space between it and the transom for casual stowage ahead of the battery shelf. The box is hinged to allow it to roll forward and open up access. Naturally there is more space within the box itself, but if seating and room for gear is not wanted on voyage it can be left at home. The coaming to side and rear is padded to give a good sprawling area for two. That box alone makes the Amberjack exceptional among runabouts for room to put stuff. Added to side pockets and the under console space this makes the boat a prince of stowage. An underdeck floodable catch tank, unusual in a pressed boat, rounds out the stowage list. The boarding platform is full width with, instead of a splash well, a transom indentation at mid beam to allow the motor to tilt. The deck is self-draining so the port side transom door is able to be full height. All the seating positions have access to grab rails. Besides the near-perimeter rail at the first class seats there is a pair of low rails at the quarters. 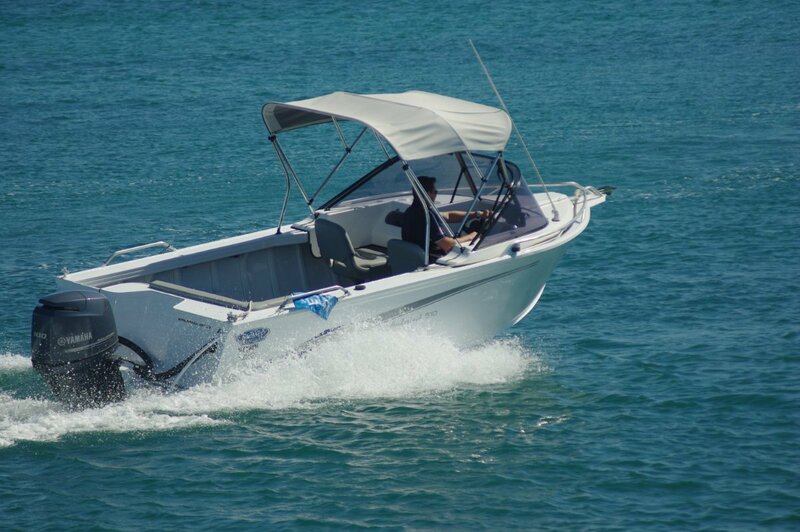 The bow rails serve a mainly decorative role except for launch and recovery at ramps without finger jetties, when the person in the water needs something to hang onto. Our trailer had the simple accessory that most trailers miss out on for no obvious reason: a walkway from tow hitch to hook-on point. More important than keeping feet dry, they make for skid-free footing. The canopy is practical rather than beautiful, and who cares? It has plenty of standing headroom and good coverage of shade. Unlike some, it is easy to furl: a storage sock is provided for that job.